There are certain people who, when faced with a mechanical or technical obstacle, can devise a workable solution. They have a special talent and a good dose of ingenuity—and sometimes a bit of help to get the concept off the ground. Bob Radocy is one of these people. Radocy lost his left hand about four inches below the elbow in a car accident in 1971. He is a design engineer by education and trade, which came in handy when he was seeking prosthetic solutions. Radocy is the founder of TRS Prosthetics, Boulder, Colorado, which designs and builds technology for people with upper-limb loss. In January, Radocy, a motorcycle enthusiast, showcased another talent: custom motorcycle design. Radocy entered his 1999 custom-built Harley-Davidson Sportster in the Colorado Motorcycle Expo’s custom bike show. The bike was more than 11 years in the making. Image courtesy of Bob Radocy. Radocy purchased a still-in-the-crate 1999 Sportster 1200cc Evo motor with rear belt drive technology in 2004. A few years later came the purchase of a radical “Mutant Curves” frame, gas tank, and integrated oil tank from Redneck Engineering. The front end, wheels, and tires were also custom from other aftermarket sources. Radocy then completed the initial design, concept, and frame geometry engineering. 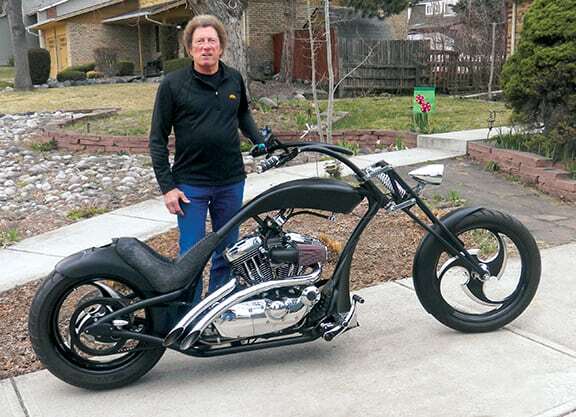 After three false starts, he found a local custom motorcycle builder, Bill Wilhelm, to take this rolling chassis to the end stages. The clutch and throttle are combined on the right handlebar, and the front and rear brakes, which are modulated to provide Radocy’s desired braking force, are operated with one foot pedal. To maintain the sleek lines of the frame, the throttle and clutch cables run through the frame. No part of this electronic publication/website may be reproduced in any form or by any means without prior written permission from Amplitude Media Group.